>When the weather is cold, we light the wood-powered water furnace to heat the house (and the water!) and shut the door tight against the chill. This was the way we lived for the first few days back home, while it was rainy and cold. Then, on day four or so, the sun banished the clouds, and the weather was mild. We threw the door open, and the garden became part of our home. In this way, the lines between inside and outside blur around here. A recent breakthrough has bridged the outside facilities, such as the outdoor kitchen and oven, with the house. We got some log slices, about 4 inches thick and a foot or so across, and have made pathways to the house and between the house and important places. Now, I can go from the house to the outdoor kitchen… in my slippers! Such a small change has really transformed the relationship of these things — the kitchen and the house, for example — to one another. 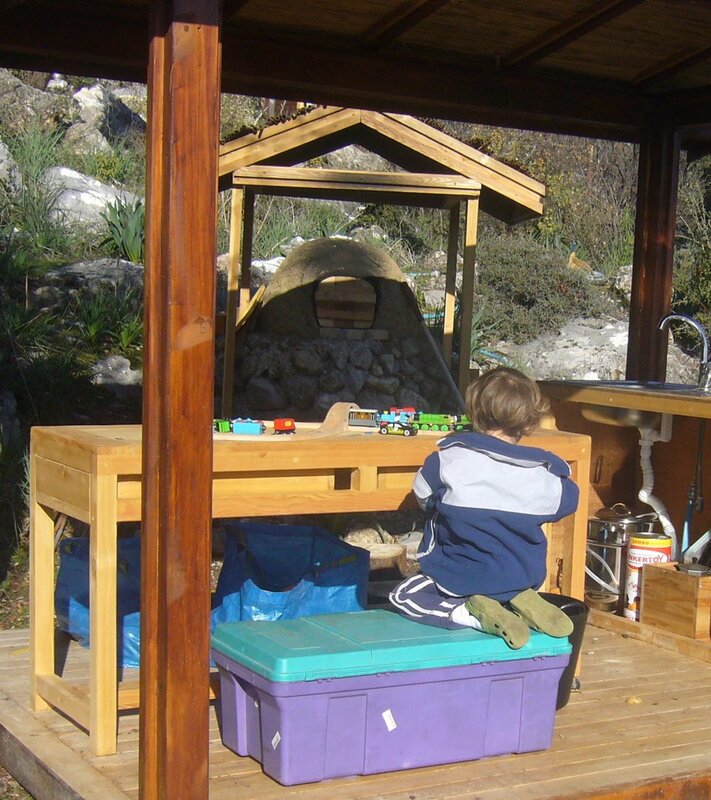 Baki has adopted the outdoor kitchen as a play area, and it is working out well because his figure-8 train track fits nicely on to the table out there. It also has the distinct advantage of being clearly visible from the (indoor) kitchen sink, so I can keep an eye on him. We went to see a friend and his wife down in Cirali, about 20 minutes away by car. They live in a citrus orchard, and the trees were heavy with fruit, and surrounded by fallen, soft, fruits. There was a slight smell of decaying oranges in the air. Ali and Baki went out with our friend to pick some fruit while I taught the wife how to knit socks, and loaded the back of the truck. When Ali came in with a few oranges, we ate them greedily — when we left, tangerines were just coming into season, but these were the first oranges I had seen for a while. We looked up from our feasting and held some out to our friend. He looked at us as if the very thought of an orange exhausted him. We resumed our eating. Citrus fatigue is sure to set in, but until it does, I will pig out on oranges. I’d better — we brought back around 100 pounds of oranges, tangerines and lemons!